NEWS EDITORS/DIRECTORS: Download photos of the incentive recipients present at the Summit under Labor and Regulation >> Photos. Pictured with DLR Secretary Marcia Hultman and U.S. DOL Apprenticeship State Director John Bolger. PIERRE, S.D. 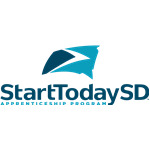 – The Department of Labor and Regulation (DLR) has provided $510,000 in incentive funding to help businesses expand the number of pre-apprenticeships and Registered Apprenticeships in South Dakota. The announcement was made at the Start Today SD Summit held at Mitchell Technical Institute on Tuesday. Businesses could apply for up to a maximum of $30,000 in funding to help offset the initial start-up costs when developing a new program. Programs designed to increase engagement for under-represented populations such as females, Native Americans, limited-English proficient individuals, youth ages 16 to 24 and individuals with disabilities was also given priority. DLR was recently awarded an $847,700 State Apprenticeship Expansion Grant from the U.S. Department of Labor’s ApprenticeshipUSA program.